Overall comment: Interesting & delicious pizzas that comes with pork! For more information on their promotions, head on to their website & find out for yourselves the load of good deals that Skippys Pizza offers! Dig into a satisfying "garlic/onion-fragrant" salad with Romaine lettuce, cherry tomatoes, cucumbers and onions. It's quite pungent & will not be something that those who dislike raw garlic/onion will enjoy. If you're a fan of lamb, this pizza is for you! I'm really surprised & delighted to find that this lamb pizza didn't have that strong "lamb/mutton smell" that could put people off! Australian lamb it is....yums! You'll find lamb meatballs, bell peppers, sun-dried tomatoes, onions and olives on this cheesy pizza :D Thumbs up! When I first saw this pizza, I was drawn to it...egg yolk oozing outta the pizza!! Don't worry, it's cooked egg-yolk, not half-boiled/cooked yolk...The lovely egg compliments the pork ham, baby spinach, mushrooms & olives on this classic tomato-sauce pizza. Oh-so-lovely! More/thicker toppings than the crust - the way I like it! Flavourful rack of ribs that is large enough for sharing, but also large enough to keep one totally satisfied. Everything is so meaty...I was kinda overwhelmed. Haha. These are really cute & bite-size, best to be enjoyed with a group of family members/friends. The lamb meatballs were great, but I didn't enjoy the "cheesy" sauce. It was indeed cheesy, but it was also kinda too "sweet" for my liking. This was probably my least favourite dish for the day. This was actually not too bad. The spaghetti was not overly drenched with olive oil nor herbs & spices, but it was nicely seasoned to give the pasta a light, yet delectable eating-experience. Simple, yet satisfying serving of spaghetti with meat balls. There's nothing much to complain of this dish. From afar, you can't really differentiate the pork & chicken burgers, but once you cut it up, you can see the vast difference: chicken meat is white (left), while pork has a slightly pinkish colour (right). Those above were the appetizer + mains. We were also served some side dishes to complete the meal! It's a nice snack, but I didn't find anything "wow" about these. These were SPICY!!! So spicy that I choked when I tried it (my throat burst into flames!). Perhaps my tolerance-level towards spicy food has dropped, but everyone at the review thought this dish was really too spicy to enjoy! My housemate who LOVES spicy food loved this a lot, but she too felt that it gets spicier as you continue eating. It's certainly a dish for those who dare to take up the challenge! Business hours: Sunday – Friday: 11:30 a.m. -11:00 p.m. & Saturday: 5:00 p.m. - 11:00 p.m. Delivery Areas: Bandar Utama, TTDI, Tropicana, Damansara Perdana, SS1-26, Mutiara Damansara, Mont Kiara, Hartamas, Bangsar, Subang Jaya, PJ Section 4-22, Damansara Heights. No deliveries during heavy rain & thunderstorms. Overall comment: This humble air-conditioned restaurant offers really meaty, fresh, & juicy crabs that comes in 17 different preparation styles! You'll be spoilt for choice! They also offer affordable & delicious Chinese-style dishes; some are very unique that you may not get elsewhere. I rarely come over to this area since it's kinda far from where I stay. My 1st time here was for uncle Tony's surprise birthday dinner & my 1st impression on the taste of the dishes was good! Aunty Jenny said this restaurant is famous for their crabs, so we decided to try it out just now for dinner. The verdict: REALLY WORTH EATING! Check this out...oh-so-yummy! I "peeled" the shell of this crab's claw, while my cousin, Lynette, took this photo...woots! I told you it's worth paying the higher price for such quality of crabs! This was very tasty as well. It's creamy & butterish with the aromatic curry leaves + chili padi to give the dish an "extra kick"/umph! It goes really well with the deep-fried man tao buns :D A very good alternative from the usual sweet & sour crabs if you're keen on ordering something with gravy. We didn't expect this to be so "wet". 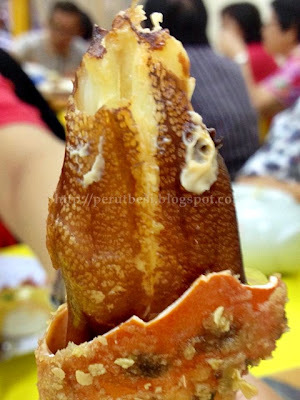 Usually, the salted egg crabs at other restaurants are "dry", with bits of salted eggs sticking on the shell of the crabs. But May Chixuan's version is slightly different. The taste compared to the "dry-er" versions are not as fragrant. We still prefer the other 2 styles. Another rare vegetable (organic) that not many restaurants offer. The way May Chixuan prepares it with mushrooms made this simple vegetable dish very "fun" to eat. As I love mushrooms & vegetables, it was a bonus dish! Braised Pork Belly with Yam/"Wu Tao Kau Yoke"
Deep-Fried Butter Prawns/"Lai Yau Ha"
A very good alternative to the prawns with their shell on. Everyone will certainly eat it since they won't need to peel the prawn shells. Restaurant's Specialty Beancurd with Spinach/"Jiu Pai Por Choy Tau Foo"
If they could add "dong kwai" & more "Chinese wine" to the soup, that would make it taste more "herbal"! This herbal chicken doesn't have enough "kick". Steamed Red Talapia with "Choy Pou"
It's a very "fung foo" vegetarian dish. Totally yummy! This place will certainly be a place I would recommend for a good Chinese meal, especially for their variety of preparation styles for the crabs. It's a very popular restaurant among those who live nearby, so remember to make your reservation before popping by! Business hours: 11:00 a.m. - 2:30 p.m. & 5:00 p.m. - 10:30 p.m.
Grandpa's 5th (death) anniversary was last Sunday. The family will usually gather for a good meal & some catch-up. Grandpa cooks very well & food is something that the family loves at all times. Some of my aunts have been trying to "replicate" his signature dishes, but somehow the dishes just don't taste as great compared to when grandpa cooks it. Hmmm....what's missing? Post CNY Yee Sang Tossing! You'll probably find this only in my family...hahaha...love! I love family dinners such as these. I'm probably one of the few fortunate & blessed ones to still have such extended-family gatherings from time to time :) It's no surprise that I am unable to lose weight!